Implants are indicated whenever at least one tooth is missing. If the missing space(s) is not filled, the teeth surrounding the space often drift, the opposing teeth in the other arch will erupt further into the oral cavity (overeruption) which can change your bite, lead to bone loss and occasionally even cause speech problems. The popularity of implants has increased steadily over the years. Implant assisted and implant supported dentures have gained a major popularity in the recent years. 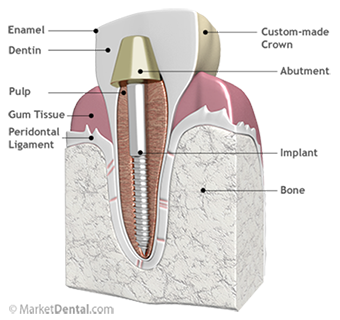 New materials and techniques have made the retention of the implant assisted or implant supported dentures superior to that of the traditional dentures. Implant body – A highly engineered medical device made of titanium, that is surgically inserted in the bone. Titanium is accepted by the body extremely well and the bone grows intimately onto it (called osseointegration) during the healing process. Abutment – This is a metal piece (again highly engineered) that attaches to the top of the implant body and forms the base for a crown, bridge, or denture. Please book an appointment with our dentist Dr. Marius Caragea to see if Dental Implants are the right option for you.